Bryant CFP® students have unlimited access to one of the most respected CFP® Curriculums available today. Our content was designed with the sole intention of delivering a best of breed educational experience to our students over the internet. We constantly update our course content, which ensures that our students are properly prepared for the CFP® exam of their choosing. Bryant CFP® students consistently exceed the CFP® Board Exam's average pass rate by a healthy margin. Bryant completely overhauled its online CFP® learning platform in late 2015. The sole purpose was to create the best online learning experience possible. The Student Dashboard (below) makes it simple to navigate to your courses, grades, quizzes, exams, virtual classroom sessions and other resources. All of the tools you need are just a click away. You never need to travel to a test center or pay a retake fee to access our quizzes and exams. Students are granted unlimited attempts on all quizzes and exams. You always access all exams and quizzes through the online platform from the comfort of your home or office. We have found that the ability to retake quizzes and exam is an excellent study tool for students who have completed the Bryant Program and are now preparing for the CFP® Exam. As a result, our retake policy does not limit your access to these crucial questions. We strive to add as much value as possible for students preparing for the CFP® Exam. The Financial Calculator Keystrokes Guide and Financial Glossary are tools that our students lean on throughout their CFP® education. The keystrokes guide is not sold as an additional text, but is instead just a click away. Same goes for the extensive financial glossary. Bryant CFP® students have unlimited email access to our Program Director and other CFP® instructors. All of our instructors have 10 or more years of experience as practicing CFP® professionals. Save time and money on travel related costs. The Bryant Program is delivered 100% online and can be accessed from anywhere with an internet connection at anytime. The program works on all computers and tablets, both at home and in the office. There is even an additional free app called "Binder" which allows you to take content offline. Students use this feature to study on planes, trains, beaches and more on tablets or laptops when WiFi is unavailable. One important note: When we say 100% online, we mean it. It's not just our content. It's our exams and quizzes as well. Bryant CFP® students never see a testing center. All exams and quizzes are completed from the comfort of your home and can be retaken as needed. No retake fees. Start preparing immediately. With our CFP® program there is no application or waiting period. You can enroll within minutes on your own and begin studying within the hour. The program is designed for all learning styles. Whether you are a beginner or an experienced professional, you can tailor the pace of study to suit your schedule and needs. Once enrolled, the first 6 courses can be started immediately in any order. You can start with any of the Program's first 6 courses and return to review each course as often as you wish. 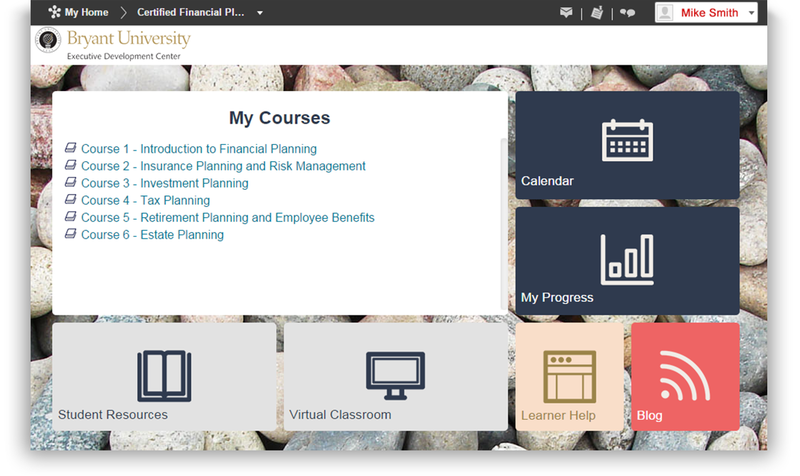 To begin the Online Financial Planning Capstone Course, the first 6 courses must be completed. Bryant's Program is hands down the best value available. It is priced competitively to help you achieve your career goals without the burden of financial stress. When you add the time and money not spent traveling to and from a physical campus the cost effectiveness is further increased. Students who achieve a minimum grade of 73% in each of the 7 online courses and maintain an overall average grade of 80% will be eligible to receive an professionally framed Certificate of Completion from Bryant University. We assure you 100% satisfaction with our CFP® program. We standby our program with a no questions asked, money back guarantee within 15 days of enrollment. Find the answers to the most Frequently Asked Questions on the Self-Paced Program.